This entry was posted on September 25, 2012 at 8:00 pm and is filed under Action, Crime, Drama, Thriller with tags 2012. You can follow any responses to this entry through the RSS 2.0 feed. You can leave a response, or trackback from your own site. I just finished Looper a couple hours ago and I can’t stop thinking about it. I’m looking forward to reading your review as well as posting one of my own. Looper’s out already!? Time’s a-flyin’. Great review. I’ve been consistently shocked by the critical reaction to this film. The trailers seemed like it would be a dumb adaptation of a cop show, with ending titles like “Academy Award Winner Michael Pena” and “Academy Award Nominee Jake Gyllenhaal” to make people perhaps think twice. Guess that isn’t the case. One of the most realistic police dramas I’ve seen. I should see this one. Nice review. Top review here – need to catch this one. Great review. Wanting to see this one. I also thought it’d be generic but apparently it’s not. I’m glad about that. You have made me so eager to see this, Moonrise Kingdom and Ted. 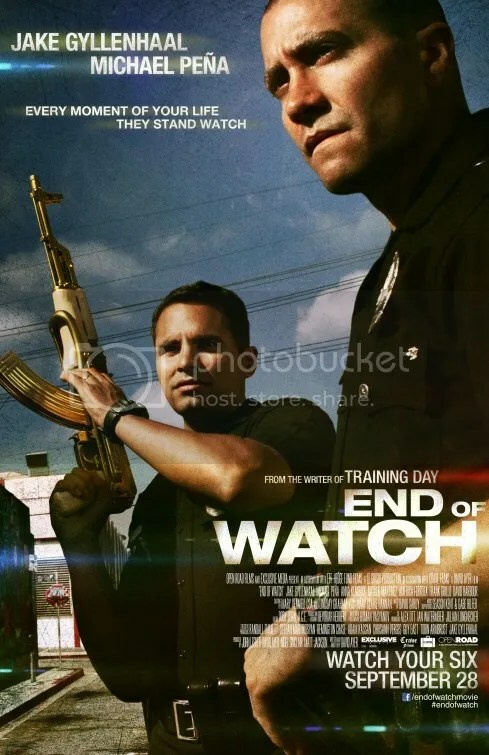 I will see End of Watch first; I think. Crime is one of my favorite genres and everyhitng in your review makes me think I’ll really like it. Gyllenhaal is a good actor and he’s very good in many movies. But I’ve never thought he ever did a “wow” perfromance. Intersted to see him in this. Excellent review! This is one of his best performances. Yes, Better than Brokeback Mountain. Always liked his work in October Sky (1999) and Donnie Darko (2001) as well. Looking forward to this, I’m a big fan of Gyllenhaal (not just because he’s easy on the eye). I haven’t seen any posters or trailers at the cinemas yet, so I don’t think we get to see it for a while yet unfortunately. After your review I can’t wait to see it! This almost seemed like an r-rated version of “cops”. That’s how real this seemed. Some of these scenes were hard to watch. We got to know these cops, and felt for them as real human beings. Acting was awesome. 3 1/2 stars. You’re right, it did have the documentary feel of that TV series. I really liked End of Watch. I am also interested in Movie Critic. See my critic on this movie.